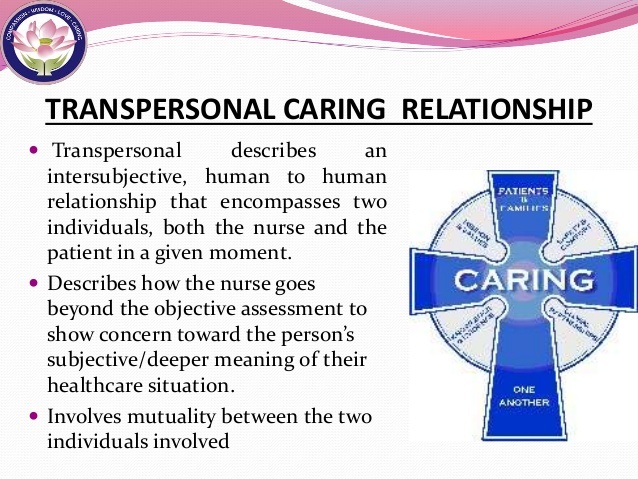 The activities by which a patient’s healing, esteem, spirituality, emotions are maintained and promoted are defined as transpersonal caring in nursing profession, also known as “Watson’s Theory of Transpersonal Caring” (Favero, Pagliuca & Lacerda, 2013). The one antecedent of transpersonal caring is the “caring moments”, this phenomena is unique in it’s being as it is those critical moments between a patient and nurse where there one to one interaction happens and during which they develop the bond with which the patient starts their healing process because they receive the notion that someone is determined to take care of them and provide comfort even in the most uncomfortable times. This phenomena can be extend to family members of the patient (Favero, Pagliuca & Lacerda, 2013). The consequence of transpersonal caring is that as mentioned earlier it’s a one to one relationship, so this concept projects the healing process ultimately the patient is half recovered by the sense of caring they feel by the nurses towards them. Although it is not the potential cure but it plays the role in initiating the cure process (Favero, Pagliuca & Lacerda, 2013). It is the tool to measure the effectiveness of a concept and to develop new techniques to enhance the concept and ensure patient satisfaction. In transpersonal caring, empirical referents assist to achieve the purpose with the tools such as patient satisfaction surveys and employee surveys (Stroehlein, 2016). Master program nurses are exposed to a number of nursing theories to enhance the professional competencies and Watson’s theory is one of them. This theory sheds light on the transpersonal caring in nursing profession and how it achieves the ultimate care and cure goals for a patient. By applying this theory in the clinical practice the nurses achieve higher patient satisfaction because they create a special bond with the patient who is the care receiver and help them reorganize their mental, physical and spiritual position (Vandenhouten, Kubsch, Peterson, Murdock & Lehrer, 2012).